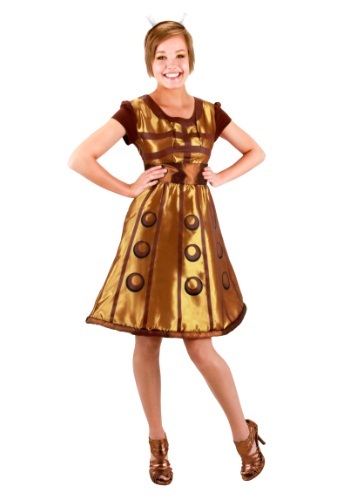 Pullover cap-sleeved dress has taffeta skirt & bodice front w/ printed "Dalek bumps"
You’re a nice person, right? You take good care of your dog and your turtle. You visit your mom once a month and nothing is more important to you than spending quality time with your friends and siblings. But, when you’re at work, all bets are off, right? They call you the Ice Queen because you don’t let anything go; no bad deals, not a cent unaccounted for, no laziness permitted from your employees, right? Some would maybe say you’re as heartless as….a Dalek. So why not embrace your true nature? There are things to get done in the workday and you have deadlines to meet and...the workplace is no place for feelings anyway. So throw on this Dr. Who Dalek Dress and let everyone know exactly where you stand when it comes to completing your tasks. This way, you can feel free to exterminate anything that gets in your way. Don’t get us wrong, you’re still a good person, but the objective comes first. And this great dress will demonstrate your mindset without having to explain it to anybody. Not to mention, this dress comes with two felt weapon accessories! Not that you might need to use them in case the Doctor shows up, but no Dalek in their right mind would ever be found unarmed. The pullover cap-sleeved dress has a taffeta skirt and a bodice front with printed “Dalek bumps.” Meanwhile, the skirt hem has casing stuffed with foam to give an overall bell shape. Also included is a velvet covered headband with soft-sculpted luminosity charges, perfect for inter-Dalek communication! So feel free to get out there and show everyone how boss you are.